Photo by Thom Huettner. 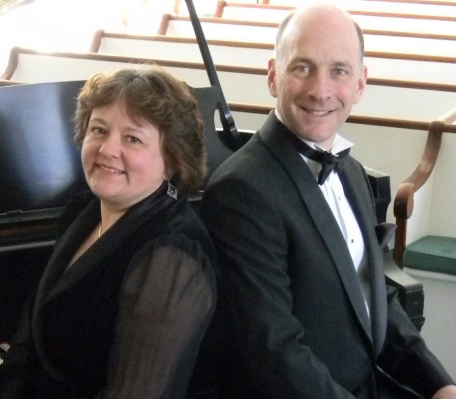 Joan Kirschner, soprano, and John Murelle, baritone, are the featured soloists for the Woods Hole Cantata Consort concert August 8 at 7:30 PM and August 9 at 4 PM at the Church of the Messiah in Woods Hole. The Woods Hole Cantata Consort, under the direction of John J. Dulina, will perform its 42rd annual concerts on Saturday, August 8, at 7:30 PM, and Sunday, August 9, at 4 PM, at the Church of the Messiah, 22 Church Street, Woods Hole. The 50-member chorus includes members from Falmouth, Mashpee, Bourne, and Sandwich, and is accompanied by a chamber orchestra, David Gable, concertmaster. The concerts are dedicated to Ezra Laderman, one of the founders of the consort; the first meeting of the group was held in the living room of his Woods Hole home in the summer of 1973. A prolific composer of symphonic, chamber, and vocal music, and film and television scores, Laderman was also dean of the Yale School of Music, president of the American Academy of Arts and Letters, and a leader of numerous arts-related professional organization. Locally, Laderman was known for his efforts to bring world-class music to Falmouth. In tribute to Laderman, Woods Hole scientist and musician Jelle Atema will play “From Ezra to Rachel, 2015,” a solo flute work written by Laderman for his daughter Rachel. Gerald Weissmann, a research professor the New York University School of Medicine and a resident of Woods Hole, will speak briefly about the harmonious blend of cultures represented by the music of the consort. Ralph Vaughn Williams (1872-1958), considered the most important English composer of his generation, wrote “Dona Nobis Pacem” in 1936 as a plea for peace, out of his concerns about recent wars and growing fears of the outbreak of what would become World War II. Inspired by Giuseppe Verdi’s “Requiem,” he used texts from the Roman Catholic Mass, three poems by Walt Whitman, a speech by John Bright, who hoped to avert the Crimean War, and selections from the Bible. The consort will perform five movements from the work, beginning with “Agnus Dei,” which features a soprano solo by Joan Kirchner and a fervent cry for peace from the chorus. In “Reconciliation,” Joan Kirchner joins Murelle in a statement about the losses caused by war. “It has been a great pleasure working with the Woods Hole Cantata Consort and helping them craft their sound,” said John Dulina, who stepped in as conductor this summer after Joe Fort, the consort’s previous conductor, was appointed to a job at King’s College in London. The text is drawn from the Roman Catholic Mass for the Dead, in Latin, and psalms from the 1626 Book of Common Prayer in English. Admission to the concert is by donation at the door. A reception follows the Sunday performance, and all are welcome to attend. For more information, visit woodsholecantataconsort.blogspot.com.